I recently acquired a Rokinon 14mm ultra wide angle lens. With around $300 this lens is much more affordable than a Nikon 14-24mm lens. The main drawback of this lens is the extreme geometric distortion is shows of. In many situation you wont notice it but as soon as you have some straight lines going across you picture you will see it rather clearly. Normally that would not be a big issue as those distortion can be fixed in software. Unfortunately Lightroom does not come with a lens profile. You can find a lens profile for a 14mm Samyang (i.e., alternative brand name for Rokinon) on a Nikon D700 through the Adobe Lens Profile Downloader. While the profile work quite well it over corrects the geometric distortion in the corners quite a bit. I kept on searching and found a Samyang profile for a Canon 5D Mark2 created by Thomas Berndt (http://ip-networx.de). This profile corrected the geometric distortion much better than the D700 profile. The main drawback of this Canon profile is that it does not correct vignetting. I took the best of both worlds and manually merged the lens profiles into a new lens profile for my Nikon D600. To download the files simply right-click on each link and select "Save Link As ...". After you copied the file into the lens correction profile folder you manually select the Nikon as make and select the Rokinon lens profile (see below of detailed instructions). 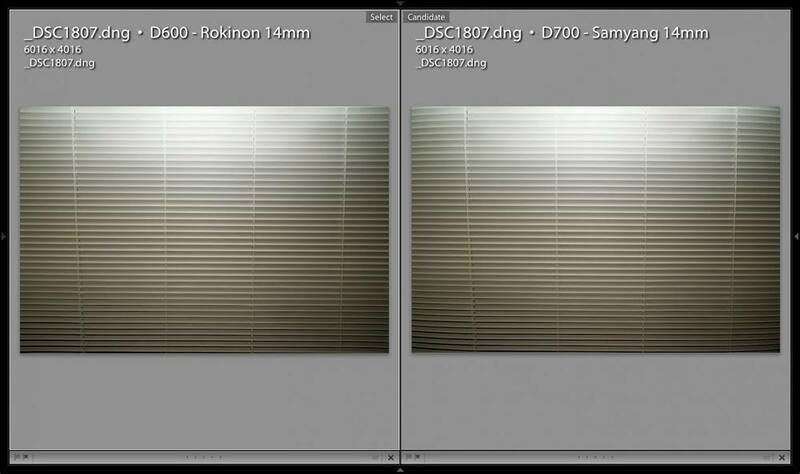 The picture below shows the a comparison shot of the D700 lens profile against the combined profile for my for my D600. Not in particular how the corners of blinds are show distortion. There is still some distortion on the D600 profile, but for all practical purposes this small distortion can be neglected.